Cardiac arrest (CA) is the most common cause of death in hemodialysis patients, and factors that improve survival after arrest are unknown. This study sought to identify modifiable factors that are associated with survival after CA in hemodialysis clinics. Patients who experienced in-center CA in the Gambro Healthcare System in the United States from 2002 to 2005 were identified. 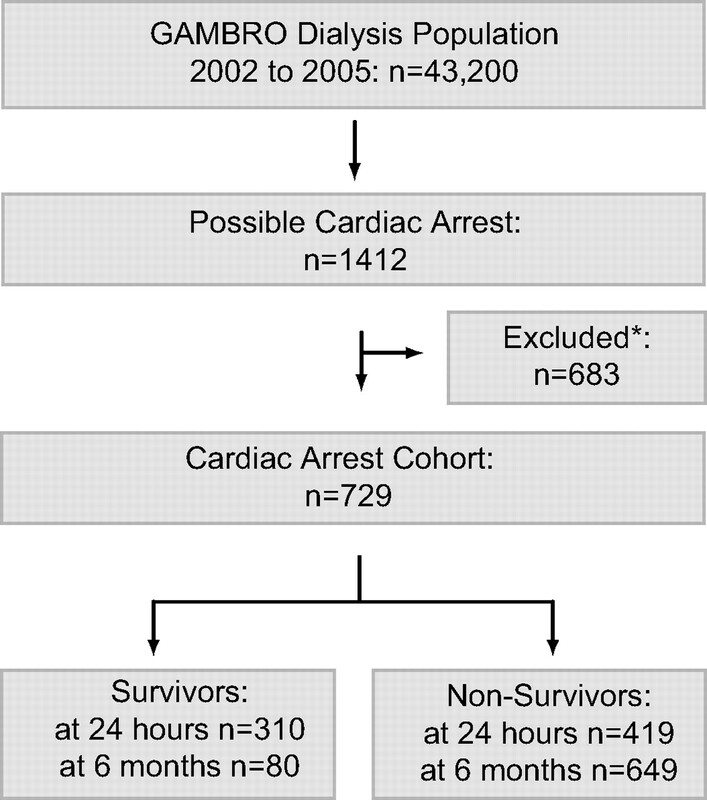 Patient characteristics at the time of arrest were compared between survivors and nonsurvivors at 24 h and 6 mo after CA. A total of 729 patients sustained in-clinic CA; 310 (42.5%) patients survived 24 h, and 80 (11%) patients survived 6 mo. Traditional risk factors, including cardiovascular comorbidities, diabetes, hemoglobin, and dialysis adequacy, did not predict survival at either time point. After adjustment for case-mix factors, presence of indwelling catheter, and concomitant medications, only use of β blockers (BBL), calcium-channel blockers (CCB), and angiotensin-converting enzyme inhibitors (ACEI) and angiotensin receptor blockers (ARB) remained significantly associated with survival (BBL odds ratio [OR] 0.32 [95% confidence interval (CI) 0.17 to 0.61]; CCB OR 0.42 [95% CI 0.23 to 0.76]; ACEI/ARB OR 0.51 [95% CI 0.28 to 0.95]). The beneficial effect of ACEI/ARB and BBL on survival increased sequentially with higher medication dosages. Prescription of BBL at the time of the event was the only predictive variable of survival at 24 h. Therefore, traditional cardiovascular risk factors were not associated with survival after CA in this hemodialysis cohort. The benefits that are associated with BBL, CCB, and ACEI/ARB suggest that these medications may improve the chances of survival after CA. The number of US patients who are projected to have ESRD in 2015 exceeds 700,000, and this figure may exceed 2 million by 2030 (1). Most of these patients will receive in-center hemodialysis, and these patients carry an extraordinary risk for death, with the overall mortality rate in prevalent dialysis patients approaching 240 deaths per 1000 patient-years (1,2). Complications of cardiovascular disease account for the majority of deaths. The single most common cause of death in patients who are maintained on hemodialysis is cardiac arrest (CA), which accounts for 61% of all cardiovascular mortality (2,3). Although many CA occur in unmonitored settings, intradialytic cardiac arrest in outpatient hemodialysis facilities is estimated to occur once for every 93 to 143 patient-years (4,5). This means that for the more than 3500 clinics in the United States, an average-sized clinic will likely need to treat a patient with CA roughly once each year (2). In current conditions in hemodialysis facilities, patients who sustain a CA have bleak prospects for survival, with 1-yr survival rates quoted between 8.9 and 15% (2,5). To improve outcomes from CA, successful strategies are likely to target event prevention and improvement of meaningful survival after CA. A few conditions have been identified to be associated with CA in hemodialysis clinics (4), but surprisingly few studies have examined modifiable factors or therapies that are associated with survival after CA in this setting. It is plausible that poor outcomes after CA result from cardiovascular risk factors or from inadequate use of proven cardiovascular therapies in hemodialysis patients. However, recent randomized trials suggested that hemodialysis patients do not enjoy the same benefit of cardiovascular disease–modifying therapy compared with the general population (6). Therefore, the pathogenesis of cardiovascular events in patients who receive hemodialysis may be different from that in patients without ESRD. Furthermore, cardiac medications such as calcium channel blockers (CCB) (7), β blockers (BBL) (8), and angiotensin-converting enzyme inhibitors (ACEI) (9) may not offer consistent beneficial effects on cardiovascular mortality in patients with ESRD as compared with positive effects of these therapies in patients with normal kidney function. The purpose of this retrospective study was to examine the association of traditional and nontraditional risk factors and therapies on survival in a large cohort of contemporary dialysis patients who sustained a CA. The goal of this analysis was to identify potentially modifiable associated factors that could serve as targets for intervention. Analysis of survival after CA is complicated by a higher proportion of deaths that occur early after an event. Because of the preponderance of ties in survival time during the immediate postevent period and the potential lack of proportional hazards, a traditional Cox-modeled survival analysis may be less appropriate to study long-term survival after CA (10). Therefore, we used a nested case-control design to identify factors that are associated with survival of hemodialysis patients after CA. A nested case-control study draws its case patients and control subjects from a cohort population that has been followed for a period of time, and this allows conclusions to be made about temporal relationships among exposures and outcomes (11). To account for the influence of each factor on survival, we performed separate analyses at varying time points after CA events to test the consistency of the effect over time. Case patients (herein referred to as nonsurvivors) were defined as patients who had died at the time point examined; control subjects (herein referred to as survivors) were defined as patients who were alive at the same time point. Nonsurvivors and survivors were identified from a cohort of 729 patients who sustained a CA in the outpatient hemodialysis facilities of Gambro Healthcare between January 2002 and January 2005 (5). Gambro was a for-profit provider of dialysis services and had 565 clinics serving approximately 43,200 patients with ESRD in 33 states and the District of Columbia for the duration of the study. We used the Event Reporting Management System (ERMS) database to collect clinical events that occurred in the Gambro dialysis facilities. This data collection system was designed for risk-management purposes and was used throughout the US Gambro Healthcare system during the period of the study. Clinics were required to report serious and life-threatening events in this database, and adherence to this policy was monitored with corporate quality assurance programs. We used a strategy that was purposely inclusive in our initial database query, with the goal of capturing all clinical events that could pertain to CA. Details of our methods for identifying and adjudicating cardiac events from the ERMS database are provided in a previous publication (5). Briefly, we culled 797 CA from a total of 1385 possible clinical events that were documented in ERMS. Specifically, events were included when any of the following key events were described in the database: deployment of an automated external defibrillator (AED), initiation of cardiopulmonary resuscitation, documentation of sudden pulselessness, lack of respiratory difficulties before the event, or a determination of CA after emergency medical services personnel arrived on the scene. Patients with missing outcome data (n = 15), as well as patients with documented “do not resuscitate” orders (n = 53) on record were excluded from the analysis. Using this method, the overall rate of in-clinic CA was not substantially different from other published event rates for the hemodialysis population (4,5). Survival status was determined for each patient by extracting the date of death from the database or the Social Security Death Index (http://ssdi.genealogy.rootsweb.com). When no entry for date of death was identified in either the Gambro database or the Social Security Death Index, patients were considered to be alive at the end of the observation period (July 31, 2005). The group was dichotomized into nonsurvivors and survivors on the basis of their vital status at 24 h after a CA event and at 6 mo after CA. We chose the earlier time point of 24 h because of the significant number of deaths that occur in this time frame and the later time points to examine the effect of factors on long-term survival. The cutoff point of 6 mo was arbitrarily selected a priori, but this time point was supported by observations that suggest that patients who have ESRD and survive at least 6 mo after a CA are likely to be discharged alive from a hospital setting (12,13). Detailed clinical and laboratory data were obtained from the Gambro clinical database. Variables that were used for the purpose of this analysis were patient gender; age; race (black, white, Hispanic, and other, as reported by Gambro); years on dialysis; the event day of the week (first, second, or third hemodialysis treatment of the week); cause of kidney disease (diabetes, hypertension, glomerulonephritis, polycystic kidney disease, other); hemodialysis access (catheter, other); and history of the following medical conditions: diabetes, coronary artery disease, congestive heart failure, and hypertension based on International Classification of Diseases, Ninth Revision, Clinical Modification codes that were recorded in the Gambro clinical database. In addition, we included the last known value for the following variables before the event: Serum albumin, creatinine, potassium, calcium (corrected for albumin), phosphorus, hemoglobin, intact parathyroid hormone, last measured urea reduction ratio, prescribed dry weight, and potassium and calcium concentration of the prescribed dialysate. Finally, we determined whether CCB, ACEI/angiotensin receptor blockers (ARB), BBL, aspirin, hepatic hydroxymethyl glutaryl–CoA reductase inhibitors (statins), and other antiarrhythmic medications had been prescribed to patients before or at the time of the event by comparing medications that were recorded in the clinical database with a list of known generic and brand names. We included prescriptions for dialysis multivitamins as a negative control. We further categorized prescriptions of CCB, ACEI/ARB, and BBL into low, medium, and high dosages on the basis of nationally published drug dosing guidelines for each individual medication (14). The recommended starting daily dosage was considered a low dosage, and the maximal recommended dosage was considered a high dosage. Dosages that fell between these two values were considered medium dosages. When published information on approximate dosage equivalence was available between medications in the same class (as were available for ACEI and ARB), these tables were used to provide uniformity in dosage designation across multiple medications within the same class (14,15). Continuous variables were expressed as mean ± SD, and the categorical variables were expressed as percentages. Univariate associations of categorical variables with outcome were expressed using odds ratios (OR) and compared with Pearson χ2 tests. The two-tailed t test or the Wilcoxon rank-sum test was used as appropriate to compare continuous variables between the two groups. Given the number of variables examined and the issue of multiple comparisons, we chose P < 0.01 to determine statistical significance. Independent variables that were associated with survival were identified using multivariate logistic regression analysis. All variables with significant univariate association at either time point were included in the multivariate model. The regression assumption of linearity between continuous variables and logarithm of the odds of outcome was explicitly tested by fitting four-knot restricted cubic spline models for each and testing the nonlinear coefficients for significance, which were then included in the final model when significant (16,17). To test for a dosage relationship among prescribed CCB, BBL, and ACEI/ARB and survival, we created logistic regression models for patients who were on low, medium, and high dosages of medication and compared them with the reference group of patients who were not taking the medication. Finally, as a secondary depiction of survival data, we plotted Kaplan-Meier curves of patient survival on the basis of medication dosage. All statistical analyses were performed using SAS 9.1 (SAS Institute, Cary, NC). The study protocol was approved by the Duke Institutional Review Board and the Gambro Healthcare Scientific Affairs and Clinical Research Department. Figure 1 summarizes our inclusion algorithm and study design. A total of 729 patients were identified as having a confirmed in-center CA between January 2002 and 2005 after exclusion of patients without outcome data (n = 15) and those with preexisting “do not resuscitate” orders (n = 53). As illustrated by the Kaplan-Meier survival curve depicted in Figure 2, most deaths occurred in the immediate postevent period. A total of 419 (57%) patients died within 24 h of arrest. Eighty (11%) patients were alive at 6 mo after the event, and 1-yr survival of the entire cohort was found to be 8.9%. Study design and inclusion flow sheet. *Noncardiac event (n = 615); do not resuscitate (n = 66); no outcome data (n = 15). Kaplan-Meier survival curve for cardiac arrest cohort (n = 729). Tables 1 and 2 outline the characteristics at the time of the CA event of, respectively, 24-h and 6-mo survivors versus nonsurvivors. Analysis at 24 h after CA revealed no significant differences in gender, age, ethnicity, or comorbid conditions between the two groups. Dialysis characteristics including vintage, the day of the event, Kt/V, the presence of an indwelling catheter, and dialyzer and dialysate characteristics were not associated with outcome. Laboratory values including serum potassium, calcium, and albumin at the time of the event did not differ between the two groups. There was a trend toward higher hemoglobin in the nonsurvivor group (11.3 versus 11.1), but this did not reach the established criteria for statistical significance (P = 0.04). BBL prescriptions were significantly more prevalent in the survivor group (53 versus 40%; OR 0.59; P = 0.0007), and there was a trend toward increasing prevalence of ACEI, CCB, and antiarrhythmic medications among survivors, although none reached statistical significance. Examination of 6-mo survivors compared with nonsurvivors (Table 2) also revealed no difference in the distributions of ethnicity, comorbid conditions (diabetes, cardiac disease, hypertension), and cause of kidney disease. Characteristics of the dialysis prescription did not differ between the two groups. However, a significantly higher proportion of nonsurvivors had indwelling catheters at the time of the event compared with 6-mo survivors (39.6 versus 18.3%; OR 2.87; P = 0.001). Other differences between the groups emerged at the 6-mo time point. Six-month nonsurvivors were more likely to be male (54 versus 39%; OR 1.89; P = 0.008), to be older (67.8 versus 63.2 yr; OR 1.02 per decade; P = 0.005), and to have a younger dialysis vintage (median vintage 2.3 versus 4.1 yr; P < 0.0001) compared with nonsurvivors. Examination of the medications that were prescribed to patients at the time of the event also yielded several significant differences at the 6-mo time point. 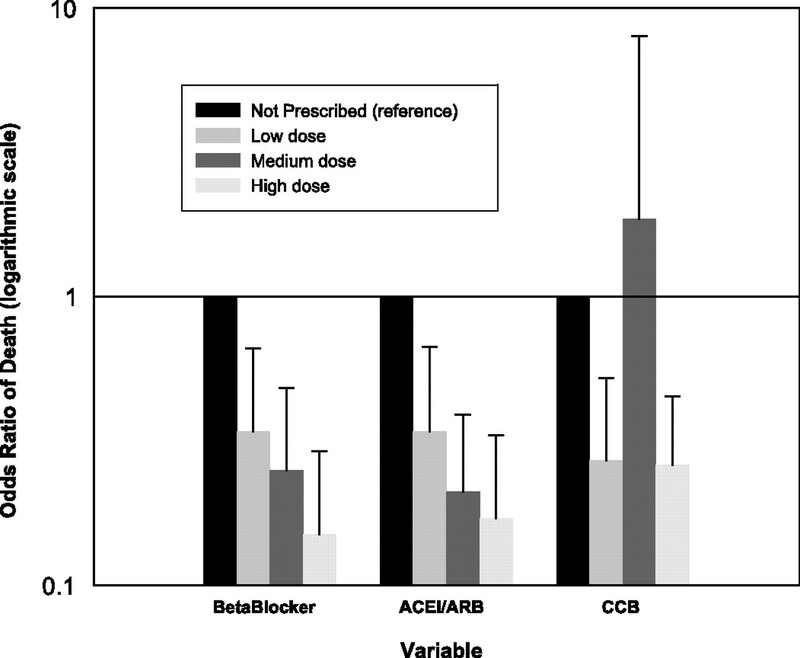 BBL prescriptions again were more prevalent in the survivor group, as well as prescriptions for ACEI and ARB, aspirin, CCB, and antiarrhythmic medications compared with nonsurvivors (all P < 0.01). Recorded use of statins was also more prevalent in survivors (P = 0.02) but did not meet the criteria for statistical significance. Prescriptions of dialysis multivitamin did not differ between the two groups at either the 24-h or the 6-mo time point. The last serum laboratory values that were taken before the CA were similar between the two groups. There was a trend toward a difference in serum albumin levels between the groups, but this difference was small (3.5 versus 3.6 mg/dl; P = 0.04). As a sensitivity analysis, we also compared the characteristics of survivors and nonsurvivors at an intermediate time point (3 mo). Variables that were associated with survival at this time point did not differ substantially from those that were identified at the 6-mo time point. All variables that were significantly associated with survival in the unadjusted analyses at either 24 h or 6 mo were included in the adjusted analysis. Table 3 illustrates the OR for death at 24 h and 6 mo for each variable after adjustment for covariates. As illustrated in Table 3, BBL were associated with significantly reduced odds for death at 24 h, which persisted after adjustment for covariates (OR 0.61; P = 0.005). Adjusted analysis did not reveal any other significant predictors of survival at the 24-h time point. Analysis at the 6-mo time point also is shown in Table 3. After adjustment, medications including BBL (OR 0.32; P < 0.001) and CCB (OR 0.42; P = 0.004) remained strongly predictive of survival. ACEI/ARB (OR 0.51; P = 0.03) and male gender (OR 1.91; P = 0.03) narrowly missed criteria for significance in the adjusted analysis. To explore further the relationships that were observed with prescribed medications, we examined the effect of dosage of medication prescribed on the OR of death at 24 h and 6 mo (Table 4, Figure 3). Using survival data of patients who were not prescribed the medication of interest as the reference value, we observed a decreasing odds of death with increasing medication dosage for ACEI or ARB as well as BBL at the 6-mo time point. A similar relationship was not found for patients who were prescribed CCB. At the 24 h time point, there was no obvious relationship between BBL dosage and odds of death (Table 4). The time course of the relationship between medication dosage and survival is illustrated by Kaplan-Meier survival curves stratified by dosage for ACEI/ARB (Figure 4A), BBL (Figure 4B), and CCB (Figure 4C). The curves seem to diverge in the immediate postevent period, and for ACEI/ARB and BBL, the curves remain separated through the course of follow-up. Unadjusted odds ratio of death at 6 mo for medications (β blockers [BBL], angiotensin-converting enzyme inhibitors [ACEI]/angiotensin receptor blockers [ARB], and calcium channel blockers [CCB]) on the basis of medication dosage (low, medium, or high). Error bars represent 95% confidence interval. Kaplan-Meier Survival curves by medication dosage (low, medium, or high) for ACEI/ARB (A), BBL (B), and CCB (C). In a large, contemporary cohort of patients who sustained in-clinic CA, we found that long-term survival was poor, with only 11% of all patients surviving 6 mo after the initial event. Most deaths occurred in the immediate postevent period. We found that traditional risk factors for cardiovascular mortality in hemodialysis dialysis patients, such as the presence of diabetes, preexisting cardiovascular disease, hypertension, anemia, and disordered mineral metabolism, were not associated with short-term resuscitatibility at 24 h or long-term survival at 6 mo. Instead, we found strong positive associations of BBL, ACEI/ARB, and CCB with long-term outcomes after CA. Furthermore, we found that prescription of BBL was consistently predictive of survival at time points as early as 24 h after an arrest. Secondary analysis suggests a positive correlation between dosage and degree of survival benefit for patients who were prescribed BBL and ACEI/ARB. The morphology of survival curves for patients who were prescribed these medications suggests that the benefits of these medications begin early after CA and persist during the ensuing months. Strategies to improve overall survival after CA can be divided into two distinct approaches. The first targets improving resuscitation efforts in the minutes immediately after an arrest. In the general population, the most important predictors of survival after CA are hemodynamic status on admission to a health care facility and time to return of spontaneous circulation after resuscitation (18,19). Accordingly, therapies that effectively and promptly reverse CA (e.g., the use of AED) have been demonstrated to be effective in improving outcomes after CA in a variety of settings (20–22). However, we previously demonstrated that the placement of AED in dialysis clinics was not associated with improved short- or long-term outcomes for hemodialysis patients (5). Apart from this study, only a small observational study examined factors that are related to successful resuscitation of dialysis patients who experience in-center, witnessed CA and found only the duration of cardiopulmonary resuscitation and preexisting cardiac disease to be associated with survival >24 h after CA (12). The second approach to the problem of CA in hemodialysis patients is to identify patients who are at high risk for subsequent mortality after successful resuscitation and to develop therapies to improve clinical outcome. Therapies such as implantation of cardioverter-defibrillators have been shown to improve long-term outcomes after CA in the general population in prospective studies (23), but cardioverter-defibrillator implantation has not been consistently associated with improved outcomes in hemodialysis patients or in patients with “predialysis” chronic kidney disease (24–26). The effect of other therapies (e.g., medications) on survival after CA in hemodialysis patients has not previously been explored. Therefore, the optimal therapy or therapies for patients who have ESRD and survive CA is still controversial. This is the first study to analyze outcomes after witnessed CA in dialysis clinics in a large cohort of patients and to assess the effect of existing, previously unexamined clinical exposures (e.g., recent laboratory values and prescribed medications) on outcome. In light of previous findings, the present study has several important implications. First, this study did not reveal associations among traditional cardiac risk factors and long-term outcome. In the general population, 65 to 70% of all sudden deaths are attributable to coronary heart disease and silent ischemia (27). Our findings suggest that myocardial ischemia and vascular disease mechanisms may not play as large a role in the pathogenesis of CA in hemodialysis patients compared with the general population. Previous evidence suggests that the milieu of kidney failure creates unique abnormalities in ventricular myocardium structure and disturbances of myocyte intracellular signaling, which may increase susceptibility to CA and cause higher defibrillation thresholds, and poor outcomes after CA are seen in dialysis patients (28–30). Further investigation into the mechanisms of CA in patients with ESRD is warranted. Second, this study revealed strong, novel risk associations with cardiac medications including CCB, ACEI/ARB, and BBL and long-term survival after CA. Many studies have characterized the effects of specific antihypertensive medications on populations with cardiac disease, but few studies have addressed whether hemodialysis patients benefit from specific classes of antihypertensive medications. A retrospective study found that CCB are associated with a 26% lower risk for cardiac mortality in a cohort of patients with ESRD, a much larger mortality benefit than generally reported among patients without kidney disease (7). Apart from their antihypertensive effect, CCB may attenuate left ventricular hypertrophy or normalize intracellular calcium concentrations and thereby ameliorate injury after CA (7). ACEI and ARB have demonstrated cardiovascular benefits in a variety of clinical settings (31,32), and ACEI have been associated with reduced mortality from CA in the general population (33). In hemodialysis patients, one retrospective study demonstrated a 52% reduction in mortality risk in unselected patients who were treated with ACEI, which was independent of antihypertensive effects (9). ACEI have pleiotropic cardiovascular effects, including reducing myocyte response to the intracardiac renin-angiotensin system (34), attenuating ventricular remodeling (35), and limiting sympathetic nervous activity (36). We speculate that these responses explain why ACEI/ARB therapy at the time of the CA was associated with a beneficial survival response in this study. Third, we found a consistent beneficial effect of BBL on survival after in-center CA. The association was strong (adjusted OR 0.61 at 24 h, OR 0.32 at 6 mo) and significant (P ≤ 0.005 in all analyses), and the effect was consistent at both the early and late time points. In addition, a dosage–response relationship was observed. BBL have been shown to reduce the incidence and the total mortality of sudden death in patients with a recent myocardial infarction and in those with symptomatic heart failure in the general population, and one randomized, prospective trial determined that BBL offered survival benefits to hemodialysis patients (8,37). The latter trial demonstrated a trend toward reduction in sudden death mortality for patients who were treated with the BBL carvedilol, an observation that is supported and extended by the current study. BBL may attenuate the effects of excess catecholamine release and improve electrocardiographic abnormalities that occur during a dialysis session, leading to an increased chance for successful resuscitation (illustrated by decreased odds of death at 24 h) and protection against subsequent events (illustrated by a decreased odds of death at 6 mo) (28,38). Our study has several limitations. First, the study design might not allow for complete capture of relevant events. However, the incidence of CA as defined in our cohort is comparable to previously reported in-center CA rates (4,5). Second, although we controlled for many known factors that influence mortality in patients with ESRD, we acknowledge that other important known and potential covariates were not measured. For example, it is possible that the medical indication for prescribing the medications might identify patients with inherent unmeasured characteristics that influence mortality (confounding by indication), even though we observed dosage–response relationships for BBL and ACEI/ARB. Some dialysis patients with lower BP or poor general health could have had contraindications for the use of antihypertensive medications. Similarly, increased medication prescriptions in general may reflect an improved level of overall patient care, although we did not detect a difference in prescriptions for dialysis multivitamins between the two groups at either time point. It would also be worthwhile to examine the influence of other dialysis-specific factors (e.g., intradialytic weight gain) on survival. While acknowledging the limitations that result from the observational study design, the hypotheses that were generated by this study warrant further prospective, controlled trials of these medications and cardiovascular outcomes. Finally, our analysis did not ascertain therapies that may have been instituted later after CA and that may have affected long-term outcome. Nevertheless, we demonstrate important relationships between variables that were present at the time of arrest and immediate (24 h) and long-term survival. The consistent association of BBL on 24-h and 6-mo survival as well as the early separation of survival curves in between patients who were taking BBL, CCB, and ACEI/ARB compared with those who were not taking medications suggests that early influences will be more important to improve outcomes from the devastating event of CA. We examined a large, contemporary cohort of hemodialysis patients and found that factors that are associated with improved survival from CA in the general population are not predictive of improved survival from CA in patients with ESRD. This study suggests that unique, dialysis-specific or kidney disease–related variables may overwhelm any risk that is associated with traditional mechanisms in this high-risk population. Furthermore, this study identifies a large survival benefit associated with ACEI/ARB, BBL, and CCB in hemodialysis patients who experience CA. In the case of BBL, the risk reduction that is associated with this therapy appears early after a CA, and the benefit is propagated long-term. This study suggests the need for prospective clinical trials of BBL, CCB, and possibly ACEI/ARB in hemodialysis patients for the prevention of death after CA. This study was supported by grant 1KL2-RR-024127-01 from the National Center for Research Resources, National Institutes of Health. This article was presented in part at the American Society of Nephrology Renal Week; November 14 through 19, 2006; San Diego, CA. J.P.M. was a member of the national Gambro Healthcare Therapeutics Committee, 2004. See the related editorial, “Can We Prevent Sudden Cardiac Death in Dialysis Patients?“ on pages 410–412. Can We Prevent Sudden Cardiac Death in Dialysis Patients?